Starting November 1, 2018, paper plans for all commercial building plans that qualify for express (“fast-track”) review will be reviewed in two (2) business days. In addition to the review time change, the submittal requirements for commercial building plans will also change. Three (3) sets of paper plans are required. Will residential walk-thru or express plan reviews change? Residential express (“walk-thru”) plan reviews are not changing at this time, but may change in the future. We will continue to offer same-day services for residential building permits that qualify for express review. 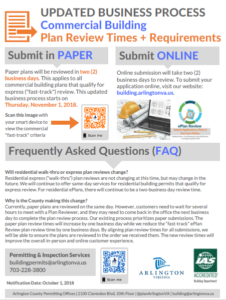 For residential ePlan Review submitted plans, there will continue to be a two-business day review time. How do I know if my plan review time is changing? Review times are changing only for commercial building plans that qualify for express (“fast-track”) reviews that are submitted on or after November 1, 2018. View the criteria for express plan reviews. Plans are not currently reviewed in the order they are submitted. The existing process prioritizes paper submissions which prevents staff from completing ePlan Reviews in order. Because the current process is less efficient, it increases in-person service wait times. Customers need to wait for several hours to meet with a Plan Reviewer, and they may need to come back in the office the next business day to complete the plan review process. How will the new review times improve the in-person and online customer experience? The paper plan review times will increase by one business day while we reduce the “fast-track” ePlan Review plan review time by one business days. By aligning plan review times for all submissions, we will be able to ensure the plans are reviewed in the order we received them. Establishing equal review times for both paper and ePlan Review submissions provides a clearer, easier-to-understand process for all customers. Overall ePlan Review processing times are expected to reduce by one business day due to improved efficiency and staff availability. In-person wait times for permitting services are anticipated to reduce for all customers. Where can I learn more about ePlan Review? ePlan Review is an online system for reviewing and approving plans for Building permits, Land Disturbing Activity/Stormwater (LDA) permits and Civil Engineering Plans (CEP). As technology advances, the County aims to leverage digital tools, such as ePlan Review, to improve services provided to customers.